Below is a display of the data in the database for Feature BIN.CRB13, a feature in Bingham, where the adjacent parish is Cropwell Butler. 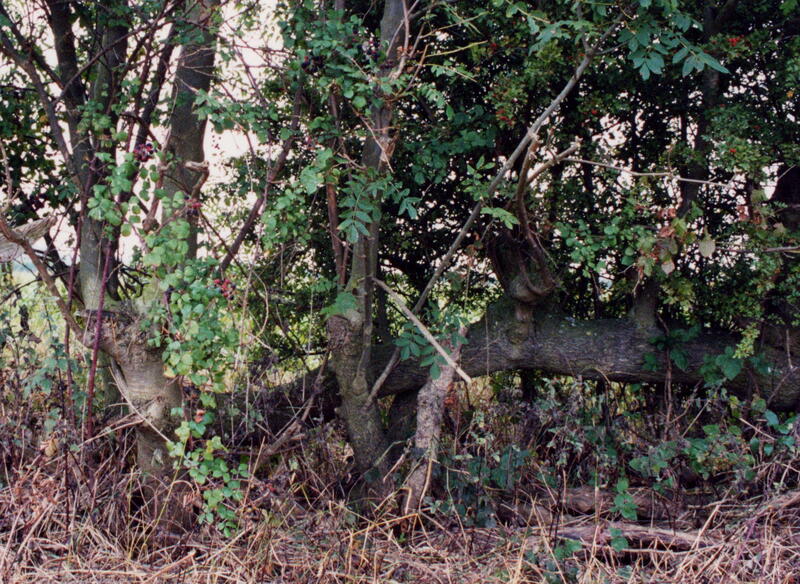 The photograph is of the ash hedge. Ash was often used in boundary hedgerows for coppicing, but in places where this ceased the trees became laid and part of the hedgerow. Hawthorn, wych elm, elder, hazel, beech, rose, field maple, blackthorn, ash, crab apple, oak. This boundary was present on the 1586 map. It marked the western side of North Field, West Field and Ox Pasture. In no part of it, however, even bordering Ox Pasture is there any sign of an ancient hedge. The most diverse stretch was still more than 50% hawthorn and had a species average of 2.2. It is clear that it has been replanted many times in recent centuries. In modern times this hedge borders 6 fields, in 1776 there were 16. Many of them were farmed from Cropwell Butler and there was a track along the southern half of the western side of the boundary from the village to these fields. There is no sign of this track now.